as some of you know, i was a vegetarian for about seven years, so i’ve eaten my fair share of tofu. even now that i’ve left vegetarianism behind, i still like tofu – it’s easy to make, healthy + full of protein, + much like chicken, takes on the flavors of whatever is around it. when i told my foodie friends that i was looking for a great new tofu recipe, + one of them suggested his kung pao tofu, i knew it was a must-try. i love the kung pao dishes at chinese restaurants + had never tried to recreate the sauce at home. so i gathered up the ingredients + got cookin’. the result? this is *better* than kung pao from your local chinese restauarnt – the sauce is spicy, complex + delicious, + works wonderfully with the tofu. even honey, who backs away nervously when i suggest tofu, ate every last piece of it. absolutely give this a try! 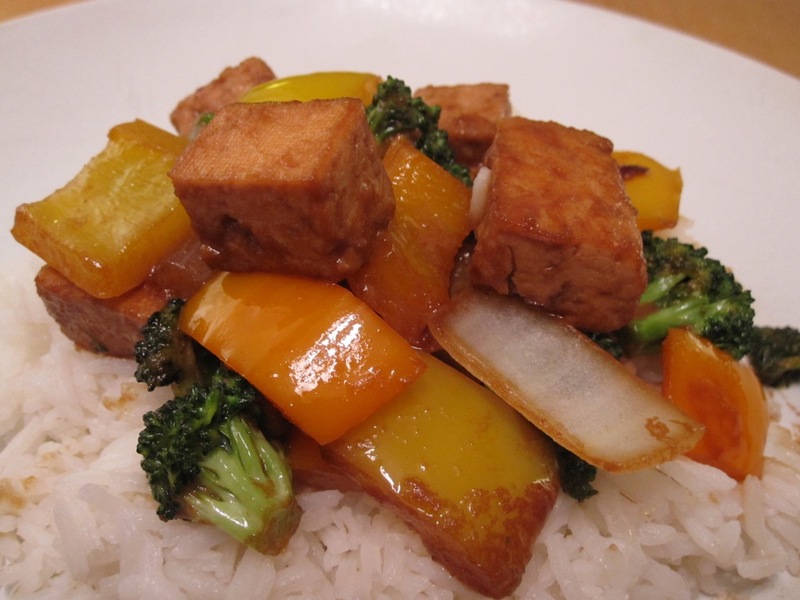 + of course, if you decide tofu isn’t your thing, you can easily substitute chicken or another meat instead. first, let’s do the squeeze. see, tofu is a big sponge, + you want to get as much of the water out as possible. so, take the block of tofu out of the package, pat it dry with paper towels, pick it up + squeeze it between your palms, then pat it dry again with paper towels. second, marinate the tofu. cut it into 1/2 inch pieces + put them in a plastic bag with the marinade ingredients. set aside for half an hour. then, in a small bowl, whisk together the ingredients for the sauce + set aside. heat your wok or pan to high heat. add about two tablespoons of oil with the peppers + onions + stir fry (that is, cook over a very hot pan while moving the food quickly) until they start to soften, about 3-5 minutes. remove from the wok. add the rest of the oil + the tofu. stir fry for about 5 minutes or more if you like it really well done. do not let the tofu sit, as it will stick to the pan/wok. put the pepper + onion mix back into the wok/pan + toss until they are hot. then add the sauce + cook until it thickens. garnish with green onion greens, peanuts, + a few drops of peanut oil. Amy – I love Kung Pao, if I do the tofu, I’ll have to cut in very small (it’s a texture thing for me). I think I’ll have to mix meat and tofu to make it palatable for my daughter, though she has some leftovers that hubby and I can’t eat (non-gluten-free), so I can make it just for us (and spicier too!) Thanks for the recipe – I never have luck making Chinese food, so I’m looking forward to this. 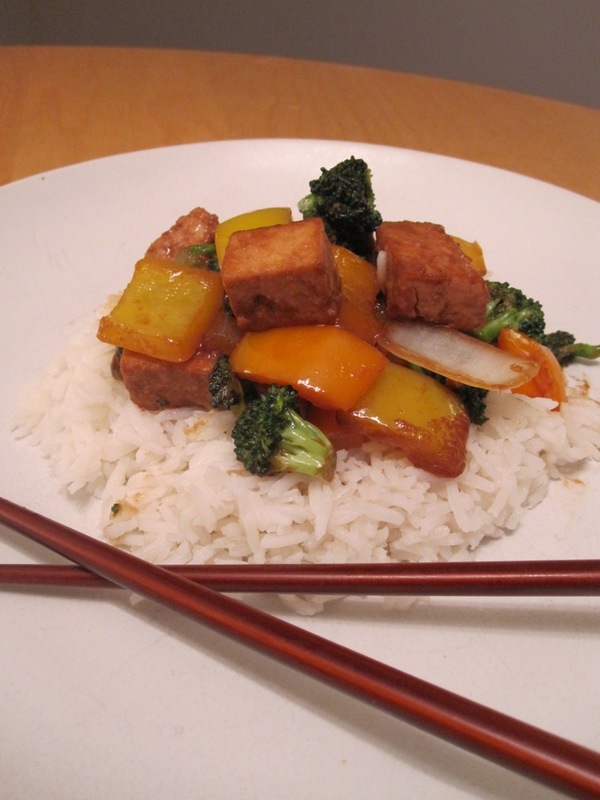 hi pat, i had never had huge success making chinese food either, until i tried this recipe! it would be great with chicken, if you decide that the texture of even small-diced tofu isn’t your thing. let me know when you try it! Wow! That looks delicious and easy to make – thanks for sharing your recipe. You did a really nice job with your photo of the dish, too! awesome, vanessa! did you use the tofu or go with meat? next time around i’m going to try it with chicken – i love chicken in asian dishes! I am thinking about making this dish for some friends in a few weeks. Could you tell me if you use this dish with noodles (if so what kind?) or with rice (also, what kind?). Hi Chris! I think it would be great with either lo mein noodles, rice noodles, or white rice. Enjoy! This dish looks delicious. I am a vegetarian but my wife is not – but i try to convert her! This will make the perfect vegetarian dish for my friends and wife. Thanks for posting it. What type of oil do you mean? Vegetable, conola, or some other?? and what does “divided” mean? Hi Chris, “divided” means you use it in separate places. So, you use 2 tablespoons in the marinade, and 2 tablespoons to fry it. Hope that helps! And as to what type of oil, I’d use peanut oil or canola oil.